Dear All, here is your next task from Frances! Would you now like to look for and post for the next topic, MANIFEST. Find examples of other artists' or designers' work you find interesting or even repellent. Whatever, the main thing is to also post 100-300 words of relection analysis and relevant context. My example is an old one from the early nineteenth century. 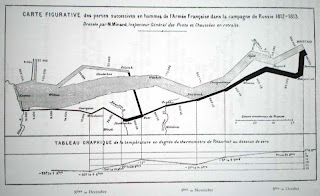 This is a graph by Charles Joseph Minard showing the 'terrible fate of Napoleon's army in Russia 1812-3' and it has six variables: the size of the army; its location on the earth; its direction of movement; and the temperature on various dates of retreat from Moscow. So starting at the left, we see the big fat block of 400,000 men setting out from Poland and moving eastwards to Moscow where the diminished army then turned back indecisively to retrace its footsteps. During October, then November and December the temperature fell almost in parallel with the path marked of the returning army ( the black line) so that when they got back to where they had started there was only a pathetic 10,000 men -only one fortieth of what they had to start with. This image still takes my breath away with its efficiency and force even though I have known about it for a long while. It is shown in Edward R. Tufte's book The visual display of quantitative information 1983 and this dry title is deceptive if you love to think about how images work. ------perhaps I should have saved this one up for 'storytellers' (our last blog)? The other thing that is exciting about this image is that it is about a story I have read often in War and Peace, so I have a lot of imaginary pictures that go with this. In addition, I know through my own research and interest that this graph comes from the very beginning of graph-making, so although we find it fairly easy to read right now, when it was made, the audience for it would have been a lot of nerdy tech. guys such as the engineering and military students from Napoleon's own educational foundation the high-status Ecole Polytechnique. Finally, it looks like this because it was intended not only to be expressive and economical, but also easy to print and reproduce: that is why it is black and white and line. So what is manifested by this? Firstly the belief that drawing could convey information sometimes better than words, secondly that organising data and presenting it together could allow you to see what was going on in complex events, and thirdly, the adventurous desire to make a speaking image in a way that had not been done before -avoiding representations of frozen artillery officers it gets this across only too eloquently like this instead. This drawing, despite lacking in detail, is one of my favourites. It was produced in the life room with a piece of charcoal that was attached to a long piece of bamboo. In this way, I was forced to give up a certain degree of control as there was a one metre space between me (standing) and the drawing (on the floor). I was unable to manoeuvre the charcoal with ease, so having lost the temptation to make a mark on the page which simply had an enjoyable sensation (the sound and feeling of charcoal against paper tempts me to curve, continue or thicken lines unecessarily) I used my clumsy implement to capture purely what I saw. Being rather flippant about what I was doing, I was surprised at the outcome. Despite the lack of tone, the lines told a story of what I saw before me and in some places recorded the weight of the body. It took me only a matter of minutes, however, unlike some of my other quick drawings it does not seem contrived. The drawing is highly inaccurate and vague, but somehow captures the tension of the pose and in that way, becomes an accurate account of that particular moment. I rarely have the confidence to record visual information with a minimum of means and this technique gave me an 'excuse' to do so and to let go. For this reason, I also see the drawing as a more accurate record of the way in which my eyes move across and survey forms as we were given no stylistic guidelines to follow in this particular pose. The drawing is direct and honest. Its immediacy appeals to me more than any other laborious pieces I have produced. This drawing is one of my faviorte recently. I use pen to express the tight structures of the part of building which from for-bidden city in China. A number of details of the elaborate decoration on the carved wooden roof which represent the stlye of classic adornments and architectures as a part of Chinese culture. The auspicious animal was critied to bring propitions life to people who live under the roofs. And also it is a wish to their descendants. Thousands of crossbeam was setted neat and tidy. That is a significant point in the style of the building in ancient China. Most of the crossbeam was paintted by red coulor. It is a blessing for life. 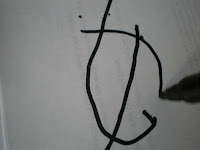 In my point of view, drawing is a good practice to analize the deeply meaning of the object. It is not only knowing the object vrey well but also it is a good collections of my future studies in Silver Smithing&Jewellery Design. These two recent drawings are part of a series of four made in the life room. In each of these studies I spent 15 minutes considering the pose and placing the marks. I like the suggestion of certain areas of the figure and the range of lines from delicate to stressed. Recently I have been almost cataloguing different groups of people as part of my research for studio work. As with these two drawings none of those include information of the facial features. Initially this was unconscious. I think I am more interested in expressing the subject's mood, emotion or surrounding atmosphere through the pose rather than this being conveyed through their facial expression. I enjoy the challenge of working with a time constraint whether this is known as in the life room or unknown such as drawings made of unaware subjects in cafes where I think I am attracted to the unpredictable shift in pose and therefore the unknown time constraint. For me these progressive studies are not only a constant aid to my observation and visual thinking but also a major part of my studio practice. This drawing is one of a series from last term "body object space" I have used various mediums from charcoal and chalk to pastel and coloured pencil. it is almost to the scale of my own body. the reason i like this one, is that u have to view it from a distance and then walk towards to see more of the details.I used masking tape over certain areas to keep them clean or draw over the top of what was there. 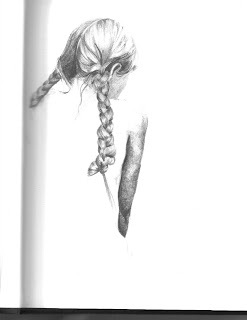 my reason behind this drawing was to document my back before i chose to put a permanent mark on it by tattooing it.I think i have captured a likeness and there are definite areas which speak of bone ,tissue,muscle and flesh .I spent around four days on this drawing while continually sketching out others. playing with the mediums i had chosen, i found a series of marks which let me speak honestly in describing my back in how it looked and felt . I chose this image because I like the soft pencil lines compared to the harsher, more controlled, black ink line. 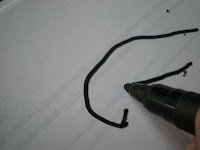 I used me left hand to draw the pencil parts then added the pen with my right hand. Like many drawings in this blog it was just a quick sketch which ended up working well because there is something very free about it. It was part of a project drawing cities we'd created from rubbish we'd found lying about. The city my group made was from cans and bottles. We were supposed to be drawing the created cities as actual city shapes, not as the objects they were created from, but I found this really tough. We had to imagine what our piles of rubbish would be if they really were a city scape and I found it really hard, I prefer to just draw what's in front of me. 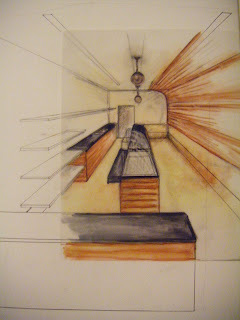 This drawing is part of my current project in Interior Design. My brief was to design a specialist cheese shop and I feel this is my most successful recent drawing as it has aided me greatly when trying to visualize my ideas and progress through the design process. I constructed a 1-point perspective in pen and then used a tracing overlay to demonstrate colour and materials. I am constantly trying to find a balance between the technical requirements of working in defined area and the expression of style, so using this combination of drawings enabled me to focus on these elements individually. The line drawing demonstrates a clear and accurate floor plan and the coloured section enhances it through detailing and the introduction of materials, therefore as a composition it is informative and expressive. Despite the drawing not being a finalised design or a well finished piece of work, I think it served its purpose in highlighting to me my projects strengths and weaknesses and allowed me to move on and resolve some of these issues. Due to this, I feel it has been of great value to my design process. 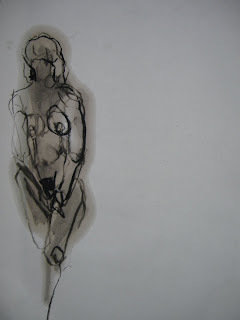 For this figure drawing i used charcoal and linseed oil on newsprint paper. I use oil to suggest a mid tone. Worked on top of charcoal can give some really unusuual unexpected marks. I love to draw with against charcoal because of the different nature of each material: the marks from the oil are soft and unpradictable whereas the charcoal is harder and more controlled. In this particular drawing, I used my left hand when using the charcoal. This made me more focussed on the drawing and produce more organic, loose marks. I often over work my life drawings. Using my left hand forced me to slow down and think more carefully about the marks i made. 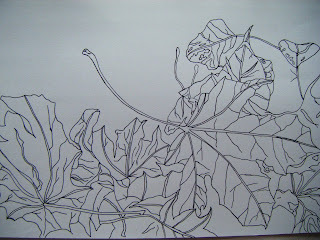 This is a very recent drawing done as part of my project in second year painting&printmaking. I am interested in applications of photography in relation to drawing and markmaking, as well as how much/little needs to be represented in order to present the idea of a face/hand/object/whatever. 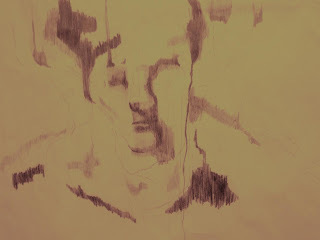 The drawing is actually done from a very blurred and distorted photograph of a friend, this is the kind of photo I would normally have discarded, however the idea of working on the intricacies of something usually so undervalued quite interested me and I have noticed that this theme of retribution of the discarded that has run through alot of my previous work. I am fairly pleased with this drawing; I was trying to use different marks to represent more and less definate shapes in the photograph (the really fine lines aren't visible as my flat is so dark!) which I hope translates into a sense of uncertainty about the true placement of the figure. I am also interested in the flatness of the drawing coupled with some tentative attempts at representing form. I realise that it looks a bit unfinished, however in the past I have had a massive tendancy to overwork my drawings so I am fairly happy with this as being a "finished" piece which simply gives some idea of a face. This is a drawing from a recent project we did in Vis Com – in groups we built cities out of scrap materials, then drew them. Our city became a series of islands, joined by bridges and cables and rope ladders. This particular image was a blind drawing, which took a couple of minutes, so I wasn’t very careful about it. I used a 4B pencil and tried to make bold lines, focussing on just one small part of the city. I felt this was a successful drawing because although it looked sprawling and unfinished, I quite liked these qualities and found they suited the subject. Something about it gave a sense of the unusual city I was drawings, its levels, walkways, uncertainties, strange shapes, juxtapositions and lack of logic. I've spent a while trying to get good at drawing faces, and I've become quite interested in them. I think the eye is maybe too far up and the ear doesn't look very connected to her head but in general I'm quite pleased with it. I drew from imagination so it's not anyone in particular, though the pose is based on the way a friend was sitting on Friday. I don't really know why I extended her hair, it seemed like a good idea at the time. The hair's ended up quite flat, which makes her face (turned away from the viewer) seem a bit disconnected. Still, it creates some nice movement which is good. white paper, scraps of paper, pencils, pastels, charcoal, 39"x79"
maybe the title is a little pathetic, but before making this work I had drawn rather figurative drawings and my aim was to pay attention to details and most desirable effect would be "photography-like" portraits. This piece of work was made in 2005. I did some life-drawing classes later but at the moment I hardly draw "pictures". I think I can be attentive to details and draw figuratively, but I do it only for the "designing" reasons, when I work on the project I draw interiors, people, pieces of furniture, plants, etc. But those drawings are only sketches made for purpose to further development in computer program. I like this particular picture, because making this I wasn't limited with the paper size (there was a "industrial size" roll of paper) and subject - it was imaginative drawing just taking some inspiration from the surroundings (picture was made in the ruins of medieval monastery during art festival). I have chosen this particular drawing as an example of a piece of work which I feel has been my most successful to date. 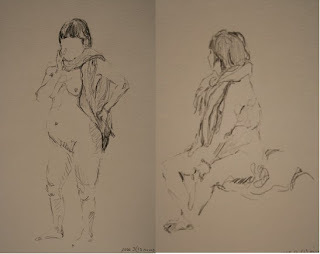 Last year I studied architecture at the GSA and as part of this course I attended a block of 6 life drawing classes. Having only studied art at higher level (design as the main focus ), this was my first opportunity to give expressive drawing a go. Much to my surprise I thoroughly enjoyed the classes and couldn't believe I was capable of completing a drawing in such a short space of time. I am the first to admit that expressive drawing is certainly not my strong point (I am now studying textiles), however I do think it's important to balance design work with interesting drawings. The tutor from the class taught me to draw "using the right hand side of my brain". This was a major breakthrough as I am a person who over analyses everything and find it so difficult to simply draw. The strict time limit in the class allowed my mind the freedom to just put charcoal to paper instead of scrutinising detail and becoming frustrated with my own ability. He taught me how to look for light and tone - something which others probably find easy but something I never properly understood. Unfortunately the classes only amounted to 12 hrs so I was only beginning to experience this kind of drawing when it finished.However, I am so glad that I had the opportunity as part of my course because it is something that I thought I would hate and probably would never have tried otherwise. I would like to go back to life drawing classes at some point because I feel with more practice I may be able to improve my drawing which in turn would help with my design work and fashion illustration. However, at the moment I don't feel I have the confidence to attend a class full of talented artists who are naturally gifted at life drawing due to my lack of experience and ability. The standard of the work posted on this blog is clearly very high and I appreciate that my drawing doesn't compare but I have enjoyed looking at everyones work, in particular the difference in styles and the depth of meaning which is evident in a lot of the pieces. My drawing is not meaningful in terms of its content but it was the new method of working and teaching which makes it successful to me personally. It proved to me that the strict, controlling part of my mind need not dominate everything I do and that letting go can actually be an enjoyable experience with positive results. 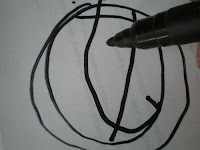 This is a photgraph of the drawing which is A1 in size. 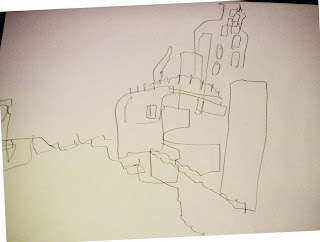 The Drawing I have chosen for todays blog, i feel is the most successful of my drawing to date, it may have areas that are not in proportion and I know that my drawing skills are not as good as other students work, but i still feel this drawing is a success to me. This drawing was done about 2 years ago at a night class at college for life drawing. At school drawing was shown to me in an almost non expressive way, and that your work had to be copied like a photograph to be successful, but in this college class i found art to be for real expression and that mistakes are fine. Which is what i felt so scared and controlled by. So this drawing is really me setting myself free using bold charcoal lines and trying my best to capture what is in front of me. I have done many more drawing since this time but its always for my design work so i feel its a different style of drawing than this one. I also have many feelings and memories around this drawing, that i feel it is successful . This is a study done of my younger brother Clinton. As a child he suffered with bad Eczema to the extent that he had to be tied to the bedposts when he slept to prevent himself from scratching his own face and drawing blood. 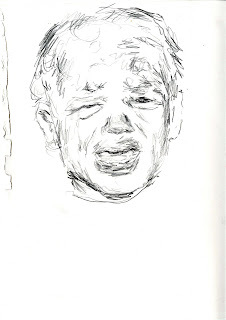 This drawing is made as a loose sketch from a photograph my dad took of him at his worst, the photograph is dominated by the extreme red of his raw skin with blood punctuating through. This drawing I wanted to be jagged in terms of the marks i was making enough to retain the same raw nature as the photograph, I did however, want to keep the study figurative and recognizable. What probably makes me regard this as a successful drawing is that I did not allow myself a great deal of time and forced myself to hold my pencil in a manner i was not accustomed to. By adhering to those two rules, i felt i did not overdo the descriptive marks whilst also keeping the awkward quality of line. As a result of very little participation in the act of drawing last term, I have felt a determination to prove to myself that any previous skills I might have had, of both observation and execution, have been retained. For me, this drawing has been a success in the sense that I feel I can still accomplish what I regard as an accurate observation. I can be very self critical of my work and often perceive it as being overloaded with information, unnecessary lines and shading, but here I feel that I've managed to evade this tendency, balancing these things to work well within my area of investigation. Conceptually, I have been investigating subjects like childhood, memory, nostalgia, exposure and horror through the absent body, so I wanted to see if I could address similar ideas with the figure present. This is probably my most recent successful drawing. 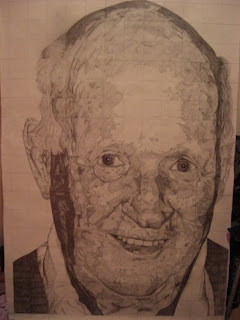 It’s a pencil drawing of my grandfather (1m x 1.5m). Having done some extensive research on American artist, Chuck Close I was inspired to try using a grid to create a hyper-realistic drawing. However when I started it, I soon realized how boring working through square after square of tone can become so began to think of how I could give myself some incentive to finish the piece. I decided to work out how much of the bursary I receive from the government for studying here each square of tone was worth and drew up a timesheet and imaginary contract of employment thus forcing myself to get a certain amount done each day. It was also a reflection on the working class ethos towards work. In all the drawing took me 52 hours and each square was worth £1.77 of my monthly bursary and loan (a cheap pint’s worth at least). I think this image was a turning point in my time here at the art school because I began to get closer to balancing traditional drawing skills with conceptualism – something which I have struggled immensely with since starting here. It also made me feel addicted to drawing again, a feeling which I hadn't had in a long time. For the first posting, I have asked you to show your most successful recent drawing, and explain why. Submit at least one image and 100-300 words of reflection, analysis and context to support this. 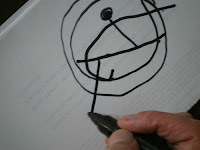 It doesn't matter what kind of drawing it is, it can be expressive, communicative, well-finished or the smallest scribble, but it has to have been useful to your practice or your thoughts. My drawing was useful for my practice as it was part of a proposal for a wall painting after a series of workshops with kids. They had each made a small object/ drawing in soft garden wire as part of the workshop, and I built them together into a large hanging net, then drew the shadows this cast. In this image we can see the wire net, the drawing, and the shadows. The stage after this was to cast these shadows onto the play space in an arts centre cafe and use that to compose a large colourful wall painting. (The proposal was accepted) To me the value of this image is that it was collaborative and assembled in a way that built an interesting and complex statement from lots of simple stages and units. I had set up the process, but we never knew from one moment to the next what it was going to look like next, but we could trust the assembly. Hi! Frances here, and welcome to my Year 2 course on drawing philosophies and practice. I've set up this space because I've written the course so that there are three weeks when I'm asking you to post your own short text with an analysis of a selected image, focussing on 3 different aspects of drawing practice today. For the first task, I'd like you to select one of your own recent drawings that you think is most successful -and explain why. When you've completed all three tasks, you should have between 600-1500 words to use towards composing your final written assignment. When I started to draw the sequence of images on this page, I had only one aim, which was to take pictures of the act of drawing, so I grabbed a marker pen in one hand and my camera in the other, and just started. --Just doing this has made me think about a few new things, and I hope that documenting, sharing and analysing your own image choices will also allow you to craft new thoughts and arguments about drawing. So I realised two things: firstly that my sequence of marks followed theformal structural principles that John Matthews (1989) describes in his essay 'The genesis of aesthetic sensibility' when he talks about the marks made by very young kids: closure or closed shape; parallel or concentric grouping; and finally perpendicular attachment (when I add those sprouts coming off the central axis). So I am up to speed with the preschoolers in my visual armoury. 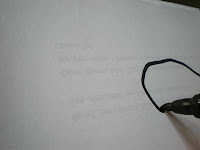 The second thing I realised is that setting a self-documenting task (e.g. 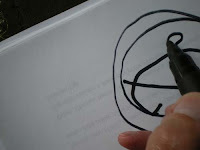 'take pictures while drawing') can work, like this did simplistically as an experiment that reminded me of some of the literature on drawing. I hope that this is a method that we can work with here together on this blog site.